Cloud Computing takes advantage of massive, shared resources to deliver services on-demand, scaling almost without limit, at an attractive cost profile. However, the multi-tenanted design of Cloud that brings these benefits raises concerns about reliability and levels of service. Is the Cloud the ‘public transport’ of the infrastructure age? 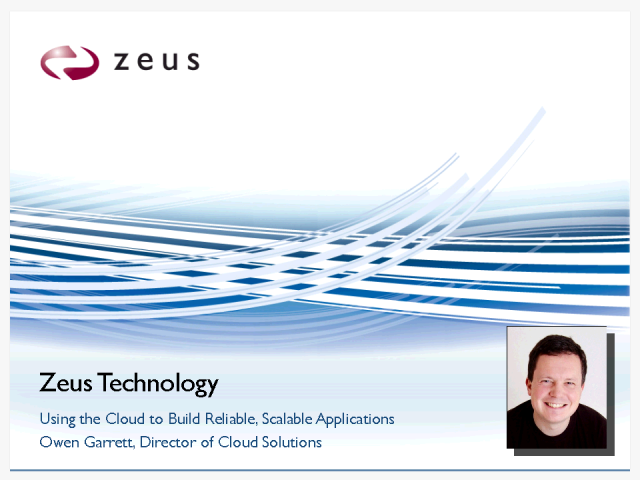 In this presentation, Owen Garrett, Director of Cloud Solutions, will discuss why performance and reliability is key, and discuss the application delivery solutions that can address these concerns and bring measurable results. Such solutions are also key to unlocking scalability in the Cloud, enabling Cloud-bursting and helping organizations to expand beyond their Cloud infrastructure deployment. Owen Garrett joined Zeus in 1999 initially as a member of the software development team. More recently, Owen’s primary responsibility has grown to include product management, strategy and new product delivery. Owen is also deeply involved in the research and development needed to ensure Zeus continues to launch next-generation software and application technologies, based on current and future customer and market demands. Owen is also instrumental in the development of Zeus’ Cloud solution portfolio and go-to-market strategy, including engaging and partnering with a range of businesses that are pivotal within the Virtualisation and Cloud environments. Owen has a strong track record in technology development and commercialisation and is a recognized Cloud evangelist speaker at key industry events. Owen studied Mathematics at Cambridge University, followed by Cambridge's Postgraduate Diploma in Computer Science. He is joint author of a number of patents relating to application delivery.